Home > Blog > Uncategorized > What is Vastu? It is an oldest Indian science of architecture and buildings which we should follow for prosperity. It helps in making a compatible setting or a place to live and work in a most scientific way taking advantage of the benefits present with by nature, its elements and energy fields for enhanced wealth, health, prosperity and happiness. Vastu gives us peace in our life also. It can also be said as an ancient mystic science for designing and building. Vastu Course in kolkata from our Astrology institute can give you a clear idea of this ancient science. Vastu sastra is a traditional Hindu system of architecture which literally translates to “Science of Architecture”. Some of the texts found that describes layout, principles of design, ground preparation, measurements, space arrangement and geometry of an architecure. Vastu Shastra helps us to make our lives better. Ancient Vastu combines all the five elements of nature called” Panchbhootas” and balance them with the human life material of the house. The designs are compatible with architecture & nature, the relative functions of various parts of the structure , and directional alignments and symmetry. Vastu Shastra is creating a congenial settings or a place to live or work, in most scientific way taking advantages of the benefits bestowed by the five elements called “Paanchbhootas” which helps to enhance prosperity, health, wealth and happiness in an enlightened environment. The word Paanchbhootas means Earth, Water, Air, Fire and Space. There are nine planets in solar system , our planet has life because of the presence of these five elements “and that planet is the Earth where we live. In Vastu Sashra regarding direction, level, shape, should be taken into consideration . For example , south-east corner is the seat of the fire , Agnidev. The importance of Vastu at the time of construction and orientation of a building is to save energy & also to have a better house design, which will surely gives comfort in life and many more. Positive Vastu can gives prosperity, good health, and wealth to the house owners/occupiers and their families. So directions of vastu is very important to influence on the human life. SURYAH SHUKRO MAHOSUNUH RACHARBHANDU BHOJUJO VIDAS| BUDHO BRIHARACHATISHCHETI DISHA CHAIN GRAHAH|| Acording to the shloka , directions of the planets are 1. Surya-Sun means East, 2. Shukra-venus means South-East, 3 . Mangal-Mars means south,4. Yuma means South-East,5. Shani –Saturn means West,6. Candra –Moon means North-East,7. Buddh –Mercury means North, 8. Guru –Jupiter means North-East. We should have the proper knowledge of the proper orientation of all the eight directions .Such as where the sun arises is known as east and where it sets is known as west . When one faces the east direction , towards one’ s left is north and towards ones right is south .The corner where two directions meet obviously is more significant since it combines forces developing from both the directions . So all the eight directions which has been already told have their’s own significance and have own construction. So these eight directions are very much essential to Vastu Sastra. It is very essential to determine Vastu directions correctly forms the basics of each construction. one should follow Vastu from the initial level i.e. from choosing a plot, directions of master bedroom, to shift in the house. Everything should be done according to Vastu rules. Since Vastu is a SCIENCE and creates a bridge between man and nature to build a house, gates, temple, palace, porch , pond etc, in proper direction. Vastu must be cheacked at the time of choosing a plot. At first we have to chose the soil maintaining vastu rules. When and how to construct a house, about all the interiors, how to choose colour and when to shift consult an expert in Vastu. 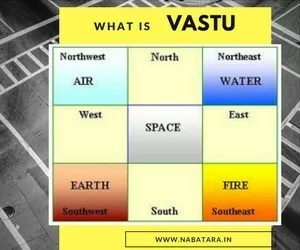 Vastu is such a deep science that can give us vast informations and one can have any doubts cleared with right reasoning. Either a Square or a rectangle shape is always advisable to go in for a site. It should not be cut off in North – East direction. Vastu was followed From the ancient time of India and it is a science that has originated from India. Feng shui is an art of invoking energies. And fengshui is originated from China and based on their traditions and culture. Both of this have a same objective, but the principles are very different to each other and the humanity gets benefited by the application of Vastu Sasthra.